The government shutdown delayed our flow of employment data, so we are just now catching up. This October edition showcases August data. Seasonally adjusted employment data bumped up by 400 from July and is up 9,200 from one year earlier. 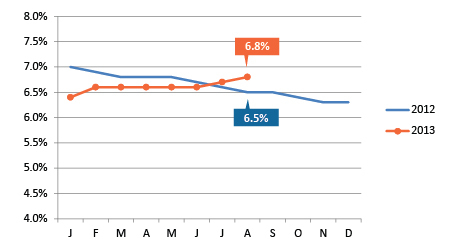 Despite the increase, the regional unemployment rate ticked up from 6.7 percent to 6.8 percent. This means the labor force increased, which is, in itself, a positive development. We just need to boost employment growth a bit more so it outpaces labor force growth. Then we'll have growing employment AND lower unemployment rates. Speaking of unemployment rates, Kansas City’s seasonally-adjusted 6.8 percent keeps it in a very familiar spot in the middle of its peer metros. The unadjusted rate was 7.5 percent. 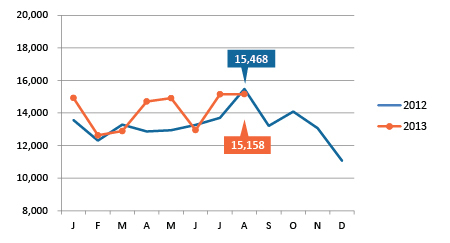 Job posting activity was flat in August and is essentially at the same level it was in August 2012. Local employment remains solid, with 9,200 more jobs than one year ago. The unemployment rate edged up slightly to 6.8 percent. 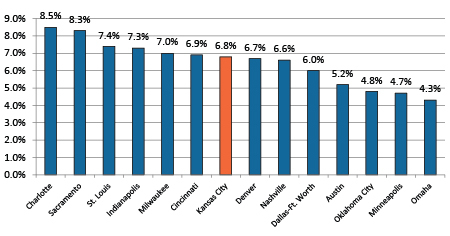 Even with a slight increase in Kansas City's unemployment rate, we remain firmly in the middle of our peers metros. 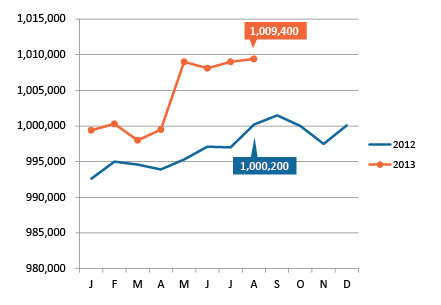 Job postings stayed steady, with 15,158 help-wanted ads. Just because we were without data during the government shutdown doesn’t mean we weren’t busy. We're pleased to announce the launch of our new Workforce Dashboard at www.kcworkforce.com. Here you can get the most recent labor market data and employment figures for key industries. You can even create your own dashboard to see the trends in your county. Be sure to check it out! One technical point: since the dashboard uses county level data, it won't be the same seasonally adjusted data we use in this newsletter, so the figures can and will differ.